With the War Belt as a classic war belt, additional tactical equipment can be carried comfortably on the hip. The integrated padding can be replaced by soft ballistics and increases protection against small calibres and shrapnel. 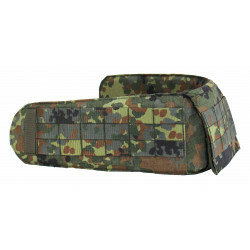 All-round Molle loops offer space for magazine pockets or IFAK. The subload opening allows the wearing of leg holsters. With the weight takeover for the warbelt, force coupling between the Vulcan III plate carrier and the belt can be established. War Belt There is 1 product. War Belt including non-ballistic upholstery. Upholstery can be replaced by suitable soft ballistics. Molle loops and opening for subload and leg holster.